If you’re in the process of upgrading the hard drive you need to perform an Operating System Backup and then restore it on the new hard drive. You can perform a Windows Backup with Windows PE and Imagex. There are many ways how to do this but this one of the readily available because you can do it with most of the tools provided free from Microsoft. Download the Windows PE CD from http://www.thecomputermanual.com/running-winpe-with-malwarebytes-cd/ and boot your computer from the CD. In addition you can put the tools on a USB stick and use the OS backup or windows transfer from a USB stick. This process of renewing the hard drive can be also used as a Windows Backup Solution. You only perform the windows backup without restoring it on the new drive. You will restore it on the same drive whenever the need arises. Is is advisable to have an online backup solution where you can store the windows backup files. Before we get to the more fancy online backup solution we can use an external USB drive on which we will store the Windows Backup Files. To do a OS backup of your Windows OS all you need now is to boot from the Windows PE CD. At the command prompt run Notepad and then click file -> Open to open a file. From the left side of the open dialog box, click Computer and then you will see how many hard drive you have. In the particular setup in the images below you will find the partitions C: D: F: you need to use Imagex to capture partitions C: and D: onto Partition F:. As you can see F: is the USB disk storage which will be used for Operating System Backup. You will create two files with Imagex. Then if you want to restore windows on a new hard drive you need to use disk part to create the partitions where the two files created with Imagex will be applied. 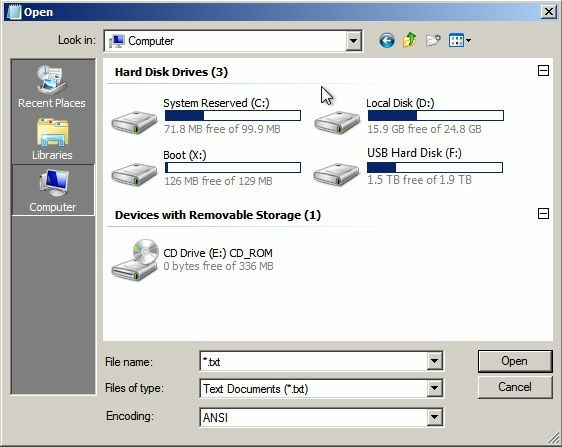 You can discover the partitions on your computer with diskpart. however it is not that visually nor user friendly. So that is why we will just use notepad to see which drives are available. You should see the partitions like in the next image. Look below how to capture with ImageX. After ImageX has finished capturing boot partition images you will have a Windows OS backup. You can use an online backup solution to hold your backup to an Offsite Backup facility in case of a fire or a physical disaster. Now if you are transferring Windows to a new Hard drive you have to partition it. If you’re just restoring the Windows OS from backup you just have to restore the files to each partition and then repair the boot process with WINRE. Click on Repair your Boot process to find out how.